I was awake at 6:30am this morning after another very peaceful night. I did my usual, sat in the cratch with my cup of tea until 8am, then woke Chris with her coffee. We seem to be keeping good time on the trip and are starting to pull ahead of our planned schedule even though we are not rushing so the plan today was an even shorter run to Hopwas but best laid plans. The morning got under-way at 8:40am (slowly getting earlier) and continued up on the Coventry. Here and there evidence of the quarries left their mark on the now largely tree lined cut and old abandoned foundations of bridges now gone remain. We very nearly missed Pooley Hall hidden behind the trees but look behind and there it was. Built in 1509 on the site of an earlier Hall it was one of the first examples in the country of a castellated brick-built manor house. The house was considerably larger than what it is today and has been repeatedly altered. Traveling on past what is left of Alvecote priory we came to Alvecote Marina and home to the Samuel Barlow free house and restaurant, named after the famous canal carriers. There were several old working boats moored here in lovely condition. The approach to Glascote Locks is preceded with rows and rows of canal side gardens and slow passage is a must as most have small craft moored there. Unfortunately I was so engrossed in staying behind a really slow boat ahead I forgot the camera. Turns out the couple had just bought the boat severn days earlier and like us were taking it home, for them, to Yorkshire. The lady had jumped of the boat as they moored up the day before and had really hurt her leg. The gent was new to helming a boat so was being overly cautious and hence the slow speed all the way to Glascote, we did not mind a we knew we were on an easy day so enjoyed the gardens as we drifted by. We arrived at Glascote locks and whilst waiting to descend I noticed a lot of steel work going on. It was then I noticed we were parked right outside Hudson boats workshops. Clearly now a busy company with new boats in various stages of completion in the marina. I also spotted one of this year's show boats. The two Glascote Locks are single locks and with traffic ascending we did not have to wait long before it was our turn, however, there were more boats coming along so by the time we cleared the locks quire a queue had formed (through no fault of ours I add). I'm guessing with Fazeley junction not far off these locks see a lot of boats all the time. the left waiting to go up and more arriving. On pass the Tamworth cruising club and a little out of Tamworth itself the canal crosses the river Tame. During the second world war it was thought the Germans would infiltrate our defences by mounting an invasion via canal or river. The aqueduct here sports a morose looking pill box at its southern end strategically placed to protect attack not only from the canal but also the river below. One can imagine the home guard keeping sentry with their one Enfield rifle and single round on many a dull night. We saw several of these along our route, some in places far from civilisation. The pill box now stands as a relic of the war years. A little further on and Frazeley Junction hoves into view. Looking much like the whole area has been recently re-developed it looks quite smart with its new builds of apartments and long term moorings. I missed the now famous bird murals but Chris managed to get a photo of them. Much photographed bird murals, as Halfie put it, Graffiti or art? Smart apartments and long term Moorings for them. I had not realised the importance of this junction until I did a little research. According to Wikipedia it was designed to provide a much shorter route to London, as all goods from Birmingham to London had previously had to pass down the River Severn before crossing southern England. However, the canal would have been useless unless the Coventry Canal link north of Atherstone was completed, and so the company negotiated with several other canals to ensure that it would be part of a much bigger network once it was completed. This included the Oxford Canal, who agreed to extend their line southwards to reach Oxford and the River Thames, while completion of the Coventry Canal link to Fradley was to be completed in three stages. The Coventry Canal company would build the route to Fazeley, which included the eleven Atherstone locks and two more at Glascote. 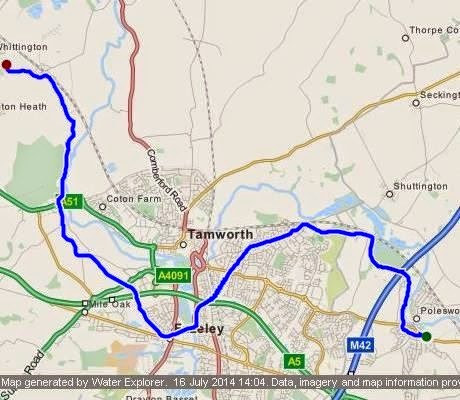 The Birmingham and Fazeley Canal would build the next section, from Fazeley to Whittington Brook, near Lichfield, some 5.5 miles (8.9 km) to the north, and the Trent and Mersey Canal would complete the route by building southwards from Fradley Junction to meet up at Whittington Brook. This section was also 5.5 miles (8.9 km) long .......phew! From here the canal continues in a general Westerly direction through leafy tree lined sections towards Hopwas but on approach the canal narrows considerably making passing other boats only possible in certain places. Luckily for us traffic on this section was light and we only met 2 oncoming boats in passable places. Interestingly after Fazeley junction bridge numbering is dropped in favour of names given by the Birmingham and Fazeley canal company who built the canal. "Balls Bridge", "School Bridge" and "Tamhorn House Bridge" can be found and many, like the one below, sport small doors in them. Apparently these hold stop planks used to dam up the canal in event of a breach. This, as the canal does run quite high above its surroundings in places and roof tops at towpath level are seen here and there. As we could not stop in Hopwas we continued to Whittington and found the perfect mooring by 2pm. Just as well as spaces soon filled and many boats passed looking to stop away from the railway line that courts the canal hereabouts. Our spot is the furthest away from the line for a while. We can hear the trains but only faintly. After a cuppa we took ourselves off for a stroll into the village and were not disappointed. Like Hopwas its a delight and some lovely properties can be found. The village post office staff are most helpful. A Co-op store is also found and looks to be well stocked as does the little pharmacist. The are two pubs. the Dog Inn and the BellInn. The latter has a good selection of cask ales but is old and dowdy but if you want a good pint don't let that put you off. Now who lives in a house like this? Update on Chris, she is still sore but the swelling is starting to go down. She is being careful not to use her front teeth when eating for a few days but other than that she is fine. She was actually winding the paddle down at the time and why the latch was off causing the windlass to spin out of control for its last half turn. She has taken Adam's advice and has adjusted where she stands when winding the paddle from now on.